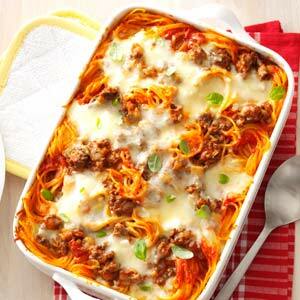 This yummy spaghetti casserole will be requested again and again for potlucks and family gatherings. Dovetailing Tip: Brown 2 pounds of ground beef. Save half to use in the Cheesburger Soup for Meal 5. Dovetailing Tip: This is a large recipe, but this spaghetti is even better the next day. Enjoy for lunch, or another dinner. It also freezes well. You will be glad you make it all! Cook spaghetti according to package directions. Meanwhile, in a large skillet, cook beef and onion over medium heat until meat is no longer pink; drain. Stir in spaghetti sauce and seasoned salt; set aside. In a large bowl, whisk the eggs, Parmesan cheese and butter. Drain spaghetti; add to egg mixture and toss to coat. Place half of the spaghetti mixture in a greased 3-qt. baking dish. Top with half of the cottage cheese, meat sauce and mozzarella cheese. Repeat layers. Cover and bake at 350° for 40 minutes. Uncover; bake 20-25 minutes longer or until cheese is melted. Yield: 10 servings.